In a previous life Tom Burns led the Hainault Action Group, setting up adventure playgrounds for young people and devising Community Events and Festivals for the local community. Tom has always been interested in theatre and the role of theatre in teaching and learning; whilst still a student at Essex University he set up and ran the first ever International Dario Fo Festival – with academic symposium, theatre workshops for students and local people – and full dramatic performances by the Fo-Rame theatre troupe of The Tiger’s Tale and The Boss’s Funeral. 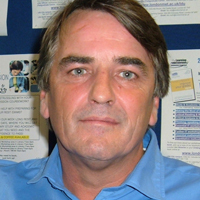 Tom is a Senior Lecturer in Learning Development actively involved with the Association for Learning Development in HE and the LearnHigher Centre for Excellence in Teaching and Learning . Working in the Centre for the Enhancement of Learning and Teaching at London Metropolitan University, along with Sandra Sinfield he develops teaching and learning resources, including the launch of the Get Ahead student conferences – a programme of events designed to promote student success that are run by and for students – and their ‘Tell us the secret of your success’ project, which produced a whole range of creative prod­ucts including a website built by students passing on their study secrets and a student video, ‘The Z–A of university’.